I have Windows Vista. Twice I have experienced that Windows has shut down and closed connected external items, 1 mp3 player and 1 external harddrive, so that they are completly disabled for further use. Is there a solution to the problem? I have lost many important documents because of this! How do I retrieve the contents stored in the mentioned items? Can you explain this a little more please? Is the computer itself or the devices not working? This happens on all computers? Ok that unfortunately means the problem is 100% with the devices and not the computer then. The MP3 player you would need to open a new question for as it is an electronic device. I can only help you with computer/computer hardware on this question which means we can only work on the external hard drive. When you connect the external hard drive to the computer does it show any sign of power at all? Can you hear/feel the hard drive spinning? Ok click on start then right click on computer. Click on manage in the context menu. Then in the window that opens on the left click on disc management. Does the external hard drive show up under disc management? It would show in the bottom middle section if anywhere and be called something like Disk 1 for example. I have tried all common ways, but the external drive does not appear in disc management. If that was the case it would only happen on this computer it may have sped up the issue but it did not cause it. If it had you would be able to see the drive on another computer. How old is the drive? That is only a coincidence as I said before if the computer caused it the drive would work on another computer. Did you happen to buy an extended warranty with the drive? If not we can try to recover the data by removing it from the enclosure and trying a different enclosure in case the usb board has failed. But that is not guaranteed to work and unfortunately if it does not it means we would not be able to recover the drive at all. I'll try other options first. As this was the second time it happened, I can't see that it's a coincidence. Windows has caused the problem by closing the devices, so there should be a way that Windows could rectify it's own mistake. I'm sure I'm not the only one having this experience? If windows did it, as I have said twice it would work properly on another computer or at the very least show up in disc management. You are not the only one who has had this happena and that is why I know how to troubleshoot it. This is a common issue with all external devices that have built in usb adapters. Both your MP3 player and your external hard drive have these. When you would like after trying other options let me know so we can continue if needed. This will be the fourth time now, windows did not cause it what you are seeing is a coincidence. Otherwise another computer would at the very least see the drive in disc management. I have had 2 other techs read this thread and both have posted agrees with me. You said you wanted to try other options before we continued. Once you have if they do not work I would be happy to walk you through testing it with a separate sata/ide to usb converter board or enclosure. There is no "start-point" or anything like that or again (5) another computer would detect the drive properly. No I can walk you through doing it yourself. You would need to either get an external enclosure or a usb to sata/idea adapter card though. You can also bring it to a local technician as they will already have one. Those are what we use to attempt to recover data from damaged drives and hopefully get them to reformat afterwards. It also means taking apart your external drive. If you bring it to a technician the average price is about $75 USD which I believe is about 450 NOK. The "usb to sata/idea adapter card" is somthing I must install on my pc? No it is what is inside the enclosure and is what allows the drive to communicate through usb. 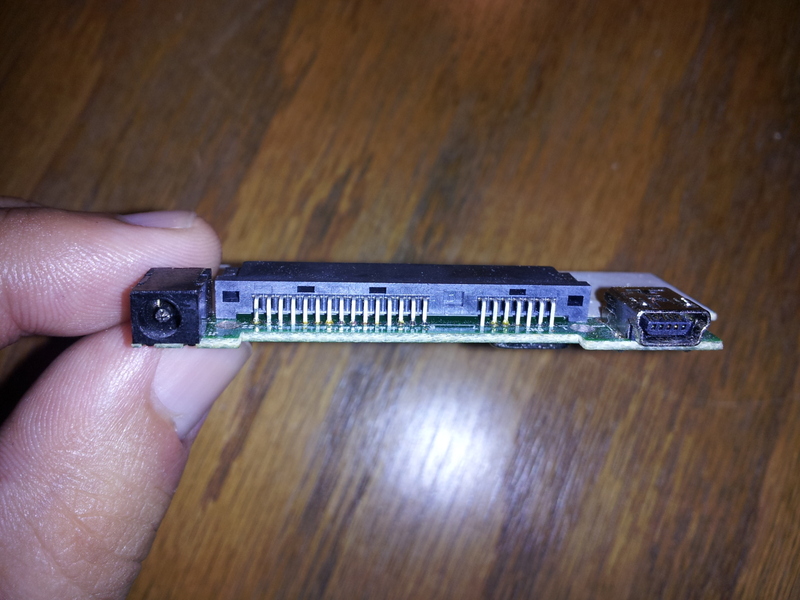 Here is a picture I just took now of a SATA adapter from a drive I recently had to take apart for the same reason. Ok. I find it inside the "box" of the external drive? Yes however you would need to use a different one which would be inside of an external enclosure. You remove the drive from yours by taking it apart. Then put it inside of a different external enclosure (any computer shop should carry them). Then you test it again to see if it is working. Personally I would take the drive apart and then bring it to a shop. If you ask them to test it with an external enclosure they can tell you if it works or not. If it does you would want to get the enclosure. If it does not unfortunately the drive is not recoverable. Most smaller shops will do this for free in hopes of selling you the enclosure. At least where I am they do. If you have any questions at all click on reply to expert and let me know. If not please don’t forget to leave a positive rating for my help - it is greatly appreciated.